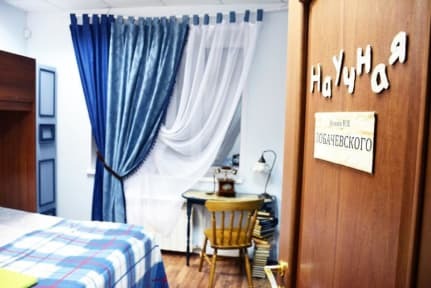 Hostel Like i Kazan, Rusland: Reservér nu! Hostel Like was opened in August 28, 2014. It is a friendly hostel with special Tatar atmospher. Hostel interior is modern, with relaxing beal-balls and walls painted in main street of the city - Baumana street. Hostel Like has 6 rooms to suit every budget from private rooms for 2-4 people or shared dormitories for 6-10 people. There are 3 toilets and 2 showers in hostel! Also you always can drink free tea or coffee! If you would like visit The Kazan Kremlin and Qolşärif Mosque just 1 metro station!. We are located with walking distance to cafes and restaurants, shopping center 'Tandem' family center 'Kazan', and to the Kazan Kremlin can be reached by metro in just 3 minutes. Cancellation policy: 48h before arrival. This hotel may pre-authorize your card details before arrival.